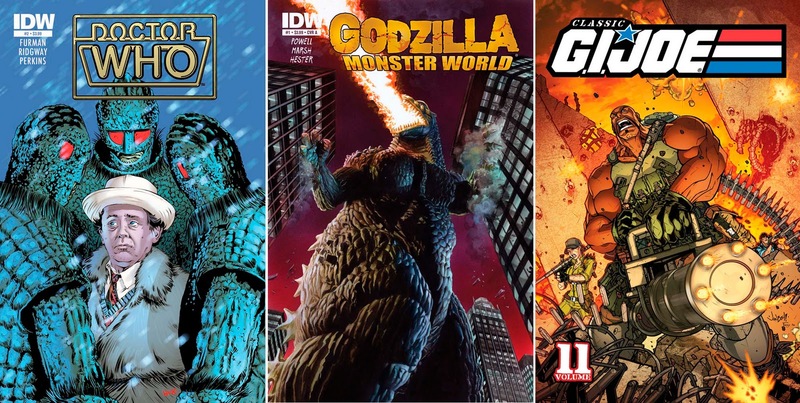 In March IDW goes all 'Classic Sci-Fi' with zombies, Dr Who, and the return of Godzilla to comics. Yip, you heard me - God-freakin'-zilla. Of all the cover art swinging through their March solicitations, here are the four shots set to stand out above all else. 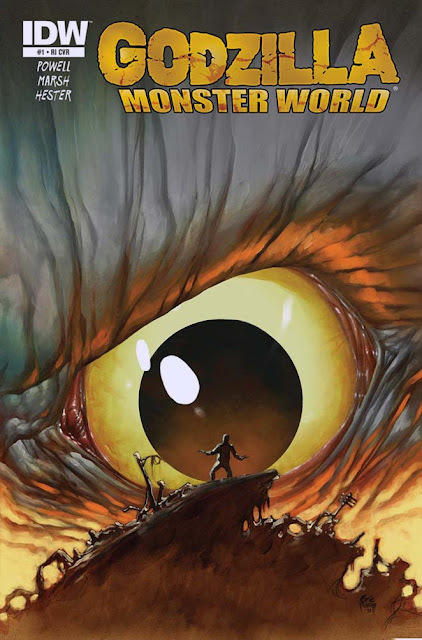 COVER OF THE MONTH: Godzilla Monster World #1 - Phil Hester What? Like a giant electric-fire breathing dragon can be beaten as a visual? Of the three variants for this issue (including one by Alex Ross below), Hester's best conveys the size of ol' Goddy - and while I don't know that loner on the rise, he's already in deep, deep trouble. CLOSE CONTENDERS: (Click to enlarge) Robert Hack - Doctor Who Classics: The Seventh Doctor #2, Alex Ross - Godzilla: Monster World (Variant) #1, and Jonboy Meyers - Classic G.I. Joe, Vol 11. For the full rundown on IDW in March click the jump. Absolutely best cover I've seen in a long time. I'd love a poster of that Godzilla eye cover framed and on the wall in the living room. Love the Classic G.I.joe cover also. By the way guys have you seen David Aja's 5 Ronin covers? The Ronin covers are gorgeous IFF. Hey guys - glad you liked the IDW choices, they have some pretty big stuff on the way. And you're right Craig that Godzilla work is worthy of framing! Imagine that eye over the mantle. AAs for the Aja covers IFF no doubt you've seen my other post by now - but thanks for the heads up! They are amazing aren't they - very sweet styles!